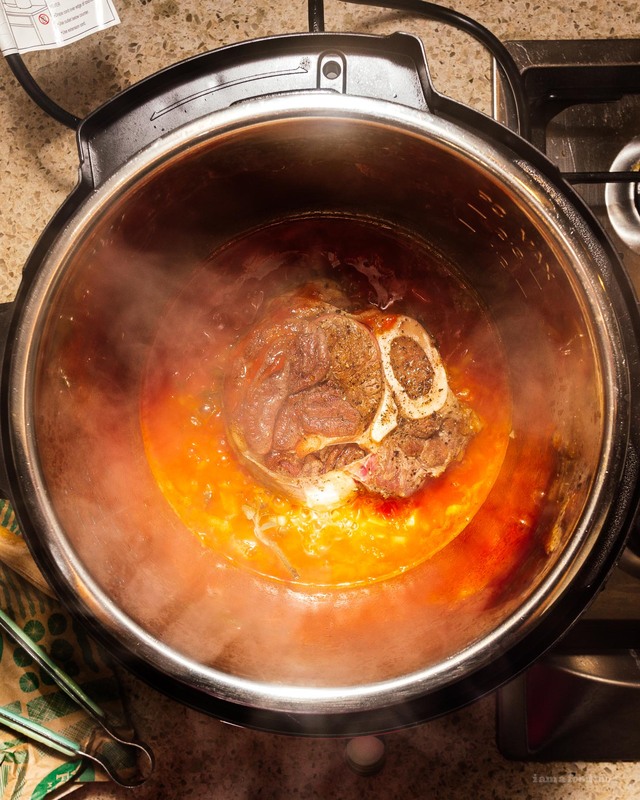 Osso Buco doesn’t get any easier than 6 ingredients and 1 hour of cook time. If you're looking for an easy but special meal to make this week, this is it. 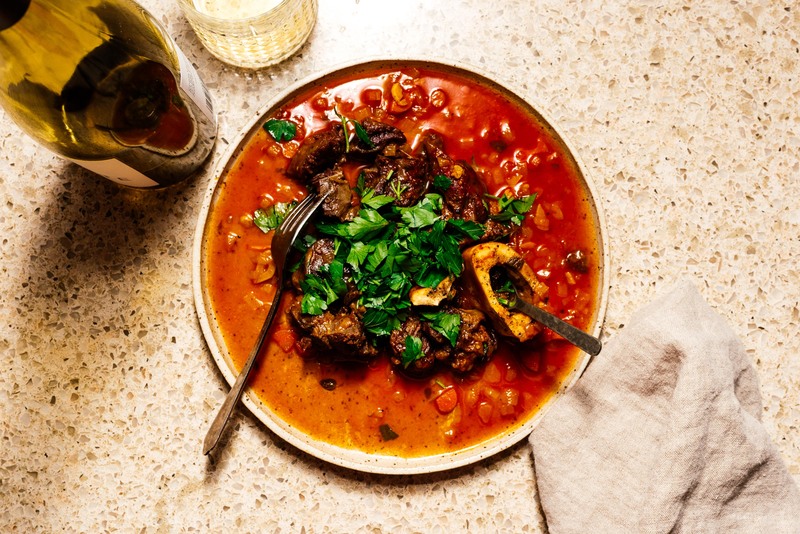 Osso Buco is one of those kind of fancy things that everyone knows about but hardly ever order, because how often do you make it past the pasta course in a good Italian restaurant? 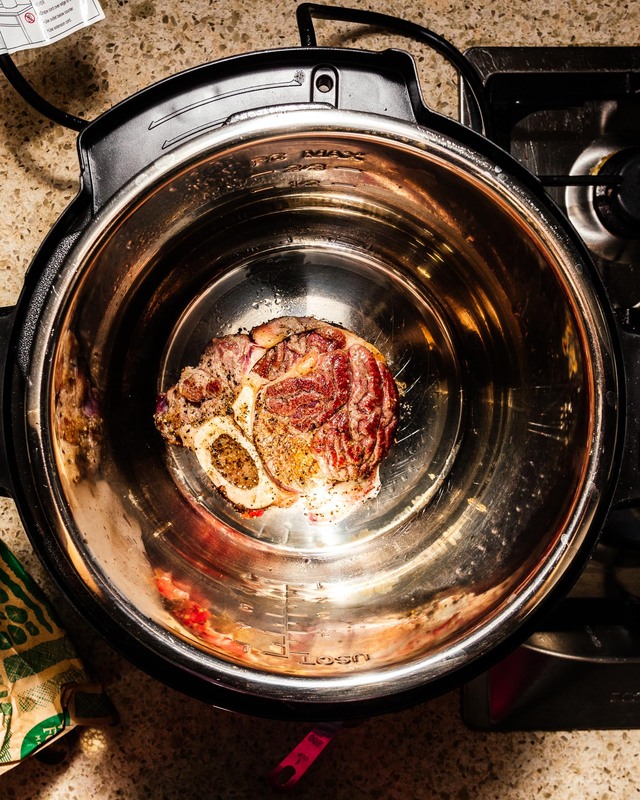 Traditionally osso buco is veal shank braised for a really long time in a white wine bone marrow infused sauce, but this is dinner and chill, we’re going 1 hour in the instant pot and subbing beef shank – unless you can find veal, in which case you can and should do it. 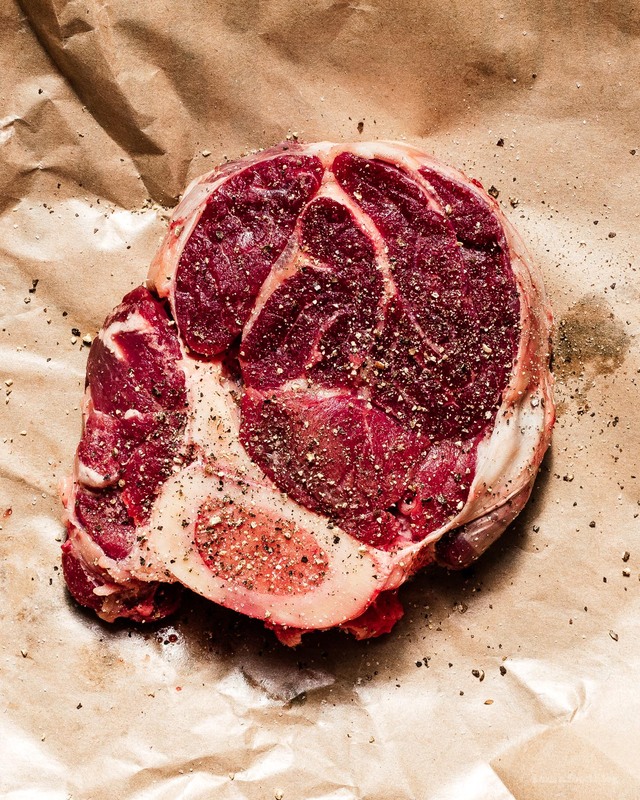 Osso Buco is an amazing recipe because the shank cut is a complex muscle full of connective tissue that just falls apart when it’s braised and almost always comes on the bone, which means bone marrow infuses the sauce and gives it an incredible body. 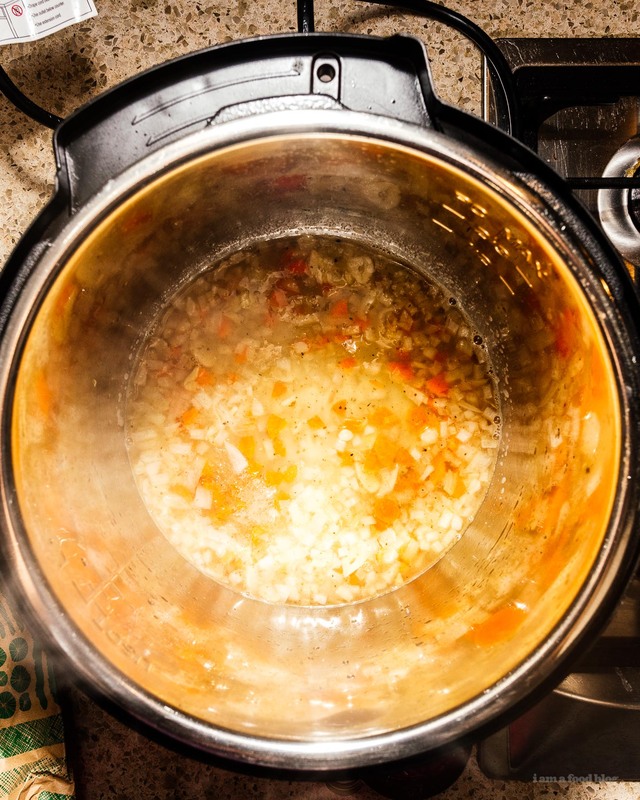 If there’s one thing the Instant Pot (or any pressure cooker) excels at it’s crushing braise times. Traditionally there a lot more ingredients and steps to this dish, but here I’ve pared it down to the bare minimum and let the flavors speak for themselves. 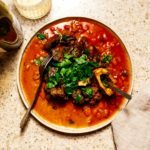 Before writing this recipe, Steph and I went to a really well regarded Italian restaurant and tried their 24 hour osso buco made with veal shank and extra marrow bones. It was amazing, but even better, this one compares favorably – and is way easier. Usually people dredge the shank in flour and use that to both brown the meat and thicken the sauce. I don’t think this needs it, the bone marrow thickened sauce is more than enough, and flour is always messy and hard to clean up. 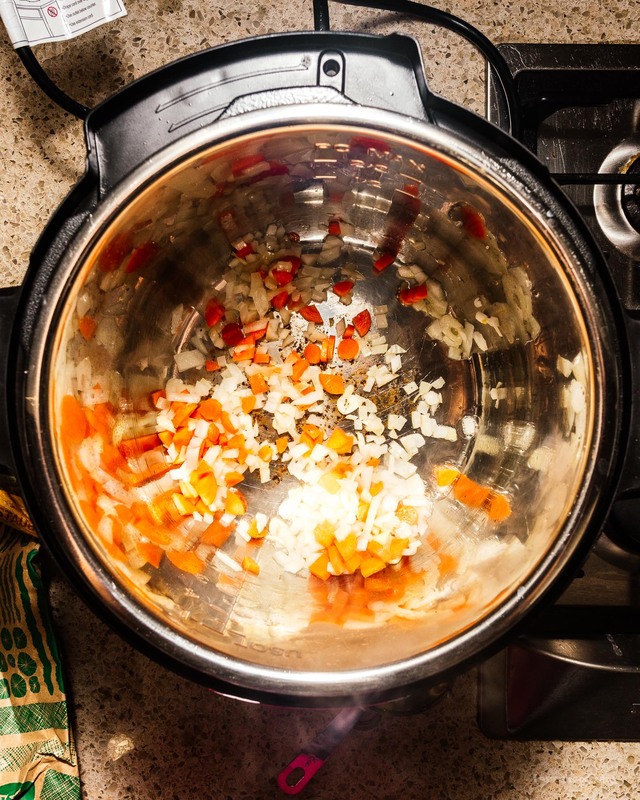 An Instant Pot – but if you don’t have one, you can make this by simmering until soft on the stove – it’ll just take longer. 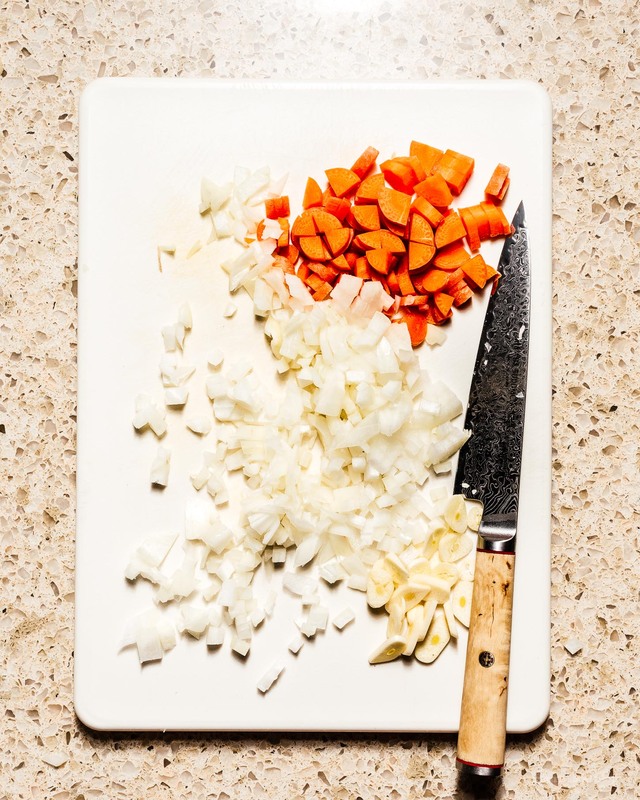 Shank is an inexpensive cut that should be easy to find – if you can’t get it at your local grocery store, whole foods will carry beef (but not veal) shanks for about $5 a slice. Herbs to make a bouquet garni are optional – I just threw in a sprig of oregano because that’s what we had and it was great. If you have fresh bay leaves, thyme, parsley, etc on hand, feel free to throw a little in, and if not, just skip – the recipe doesn’t need it. Passata is an uncooked strained tomato puree. It’s specified here because the fresh tomato flavor really brightens up the dish, but if you have a can of regular old crushed tomatoes around, just use that, it’s not worth hunting down passata. Osso Buco is typically served with risotto, gnocchi, or pasta, but we like ours with bread or on its own. If you plan on eating this on its own, you might want to double the recipe to get enough meat for 2. 7. Add passata, herbs if using, and the shank to the pot. Set pressure to high and braise for 1 hour. Quick release when done and serve, garnish with grana padano, red pepper flakes, and flat leaf parsley if desired. This recipe looks absolutely amazing!! Can’t wait to make this. I did have one question – the ingredient list has 1/2 cup passata listed, but the recipe directions say 1 cup. Which is the correct amount? Thank you!! Can’t wait to make this. Oops, thanks for the catch, it’s 1/2 cup passata, fixed now!